For my final blog of 2013, a year in which I’ve discovered so much and rediscovered something inside myself, I’d like to introduce you to a beautiful artist. 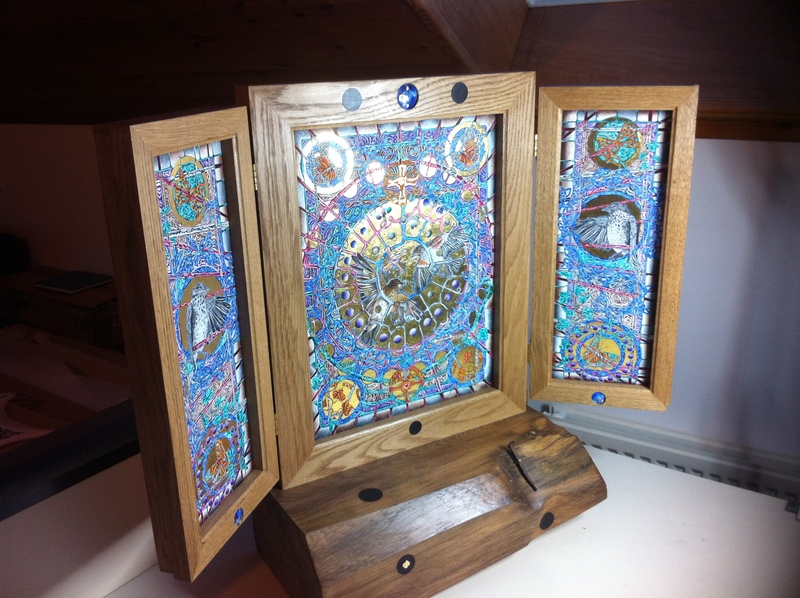 Judy Hurst, a local lass from County Durham, radiates warmth and welcome, and her artwork, inspired by the illuminated gospels and her love of architecture, history and wildlife, is not only beautiful but brilliant too. Judy’s house, with her studio situated upstairs, is in the County Durham village of Lanchester, once home to a Roman fort on Dere Street that led north from York to Hadrian’s Wall. History is all around her; Celtic, Roman, Anglo Saxon. Vulnerable to raiding Scots, settled by Vikings, and one of the great manors of the See of Durham, it wouldn’t take much to imagine life in times gone by, especially if you were out walking or cycling, like Judy, in the hills and woods nearby. Judy makes me tea and brings a plate of biscuits, and shows me pictures of a recent trip to Lindisfarne. She goes there every year, to the United Reform Church of St Cuthbert, where she sleeps in the bothy, converted from the vestry, and works on her artwork. And then we go upstairs, into her studio, and she shows me her artwork – finished pieces and pieces still being worked on. We’re not talking ‘normal’ artwork here – this stuff is unique, and with amazing materials too. 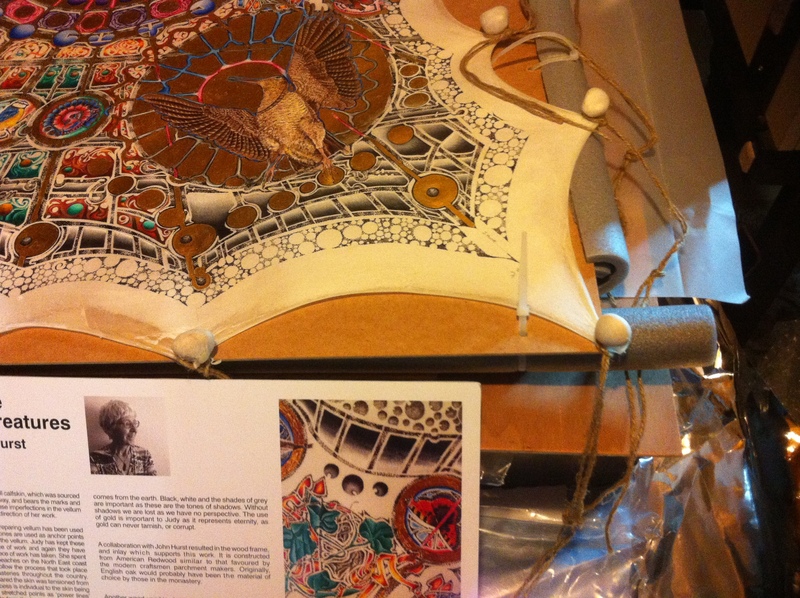 Judy works on vellum, parchment made from the skin of a calf, cleaned, bleached and stretched on a frame. This is how the Lindisfarne Gospels were made, and all those other gospels that travelled the seas and brought the word of God in lands ravaged by war and at the mercy of nature. Acts of Parliament are still printed on vellum to this day, kept in the House of Lords Public Record Office since 1847. Judy’s vellum comes from William Cowley Parchment Makers in Buckinghamshire. It was they who supplied vellum to the Royal Household on which the Royal Calligrapher wrote and illuminated an ‘Instrument of Consent’, signed by the Queen and sealed with the Great Seal of the Realm. This document gave Her Majesty’s formal consent to the marriage of Prince William and Kate Middleton. When vellum is stretched, the skin is attached at points around the circumference with cords. To prevent tearing, the maker wraps the area of the skin to which the cord is to be attached around a pebble, often called a ‘pippin’. Judy’s pippins come from Lindisfarne. She collects them each year from the beach near the lime kilns and takes them down to Buckinghamshire. 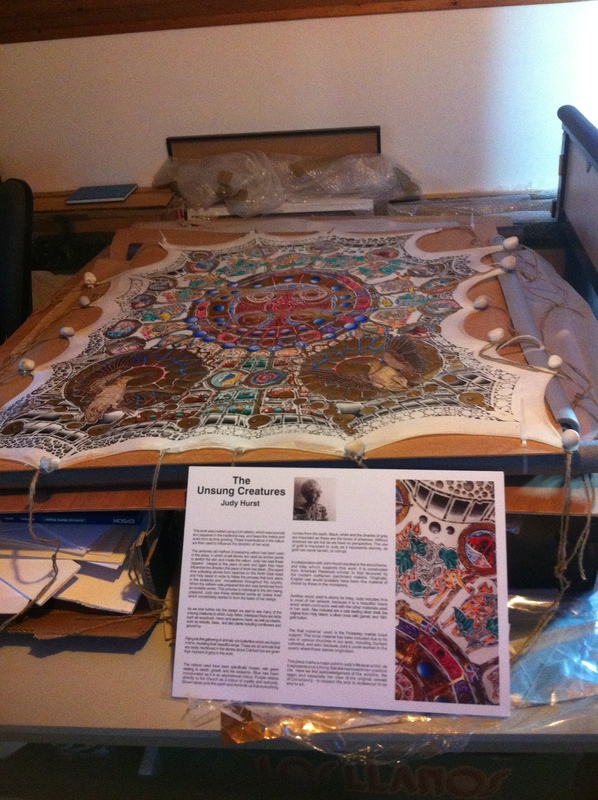 So what did she think of this year’s Lindisfarne Gospels Durham exhibition? Like Professor Richard Gameson, Durham University’s hugely engaging and informative expert on the history of the book, Judy’s favourite gospel is actually the Durham Gospels. Judy taught art in New Zealand but came back to Britain after three wonderful years there because of elderly relatives. After teaching at eight different schools in County Durham, she now concentrates solely on her own artwork and has had regular exhibitions for a number of years now. An exhibition at Bowes Museum a few years ago and this year’s Lindisfarne Gospels Durham Exhibition have now increased her reputation to a worldwide level. 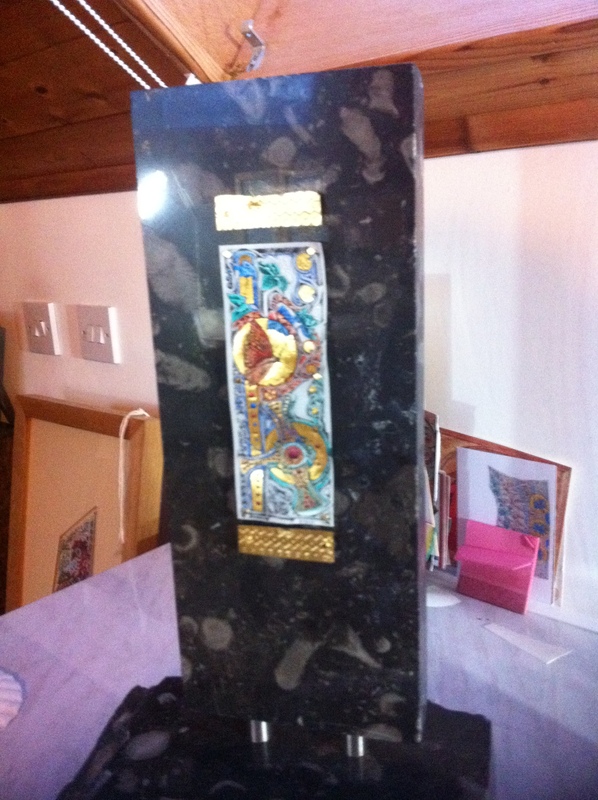 You can see her work at St Cuthbert’s College, Durham University and also Durham Cathedral. Or you can see more of her work online at her website…. 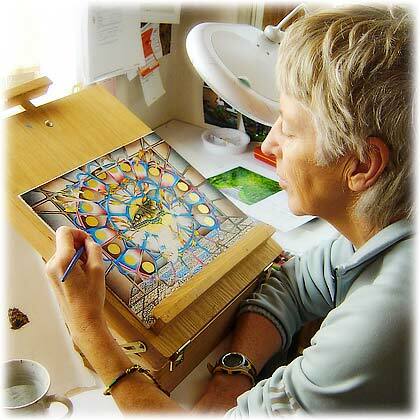 All of the frames for her artwork are made by her husband John. Meeting the Cross uses salvaged oak from the belfry of Durham Cathedral, while Frosterley Marble, taken from the Rogerley Quarry just twelve miles from her home in Lanchester, is also used in some of her work. It is Frosterley Marble that the Normans used to surround the shrine of St Cuthbert in Durham Cathedral, where his body lies under a marble slab. 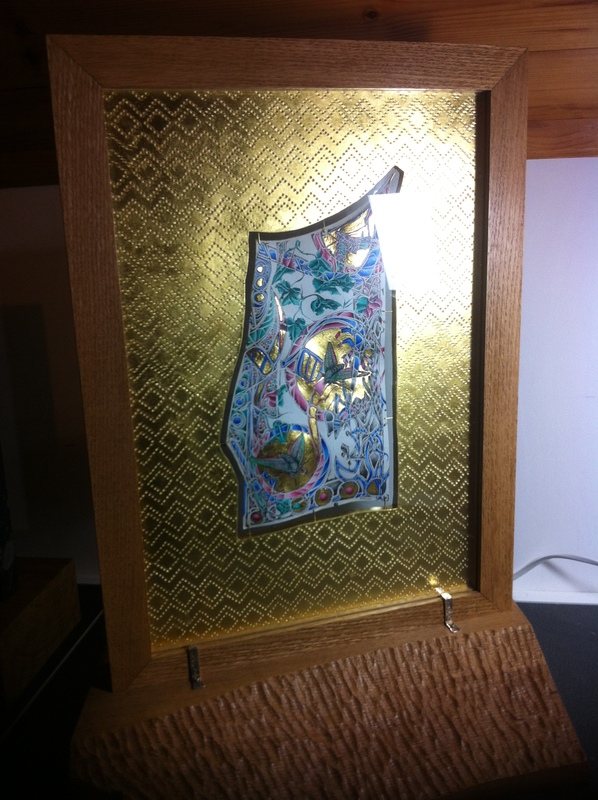 Her piece inspired by the Durham Gospels, meanwhile, has a titanium frame. 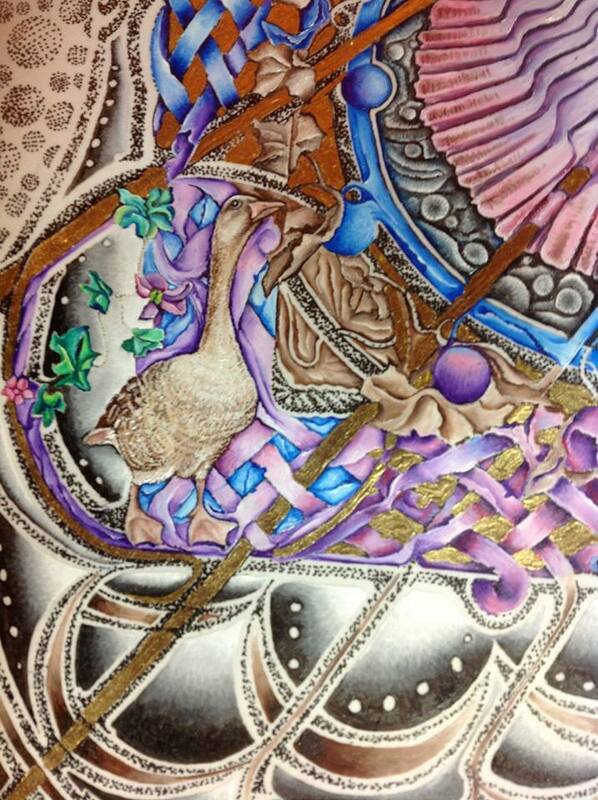 So how does Judy actually create such detailed and exquisite pieces of work? And then of course there’s the earth, source of much of the inspiration behind her work. I’m a great fan of Judy and her glorious work myself, and always look forward to her exhibitions. Wishing you a very happy and creative 2014 . . . Thank you Gillie – and loads of happiness and creativity to you as well, another fine (no pun intended) artist…..
Good to have you blogging again. Thank you for sharing the work of this amazing artist. What fabulous and meticulous work. I hope her fame spreads near and far. A happy and blessed new year to you and your family, Richard! This entry was posted on December 30, 2013 by richardwhardwick2013 in Blogs by Richard W Hardwick and tagged durham cathedral, judith hurst, judy hurst, lindisfarne, st cuthbert, vellum.